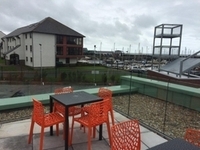 Aberystwyth Fire Station is the latest scheme to highlight the benefits of a collaborative and sustainable approach. 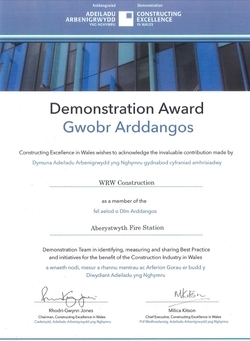 WRW Construction has seen its work with the design and client team for the Fire Station become part of Constructing Excellence in Wales’ (CEW) Demonstration Programme as well as Enabling Zero Waste (EZW). 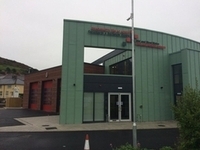 Following the EZW update and Final Peer Review event held last week the Fire Station passed and has been awarded CEW Demonstration status. Congratulations to the whole team behind the project! 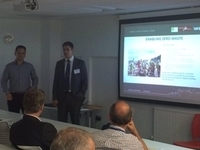 WRW, Lawray Architects and Mid and West Wales Fire and Rescue Service worked with the Enabling Zero Waste (EZW) team to minimise waste during the demolition and new build of Aberystwyth Fire Station. All parties involved in the project from the contractor, client, architect, supply chain and waste management company were all committed to the initiative and successes were achieved as a result of this. The demolition phase achieved a 91% diversion of waste from landfill achieving Welsh Government’s current target of 70% of all waste, by weight, shall be prepared for reuse, recycled, or recovered by 2015/16. The project success also exceeds Welsh Government targets of 90% waste diverted from landfill by 2019/20. The construction phase achieved 99.6% diversion of waste from landfill. Although diversion rates from landfill are high, 46.6% of waste was recycled with 53% of the waste produced (the majority of which was mixed waste) sent for energy recovery. 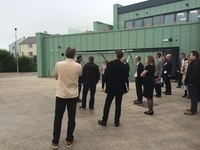 Other successes on the project involved undertaking a pre-demolition survey to identify opportunities for reuse and recycling and the setting up of closed loop takeback schemes for waste offcuts. Aberystwyth Fire Station’s interim EZW report can be found here.